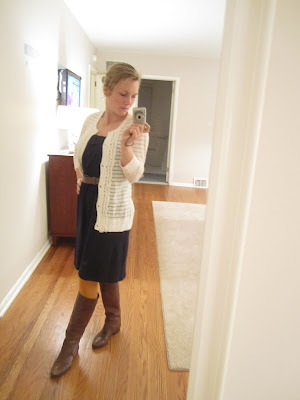 Swoon Style and Home: Flat Boots! Take Three! I have to send a huge thank you to Jamie! 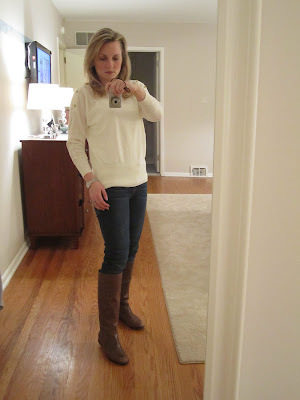 A few weeks ago I was lamenting the fact that I had received a gorgeous pair of flat riding boots for Christmas and couldn't wear them to work - I just couldn't figure out how to incorporate them into a business casual wardrobe. Jamie tonto jumped on it and posted a slew of ideas ... and boy did I take the bait! 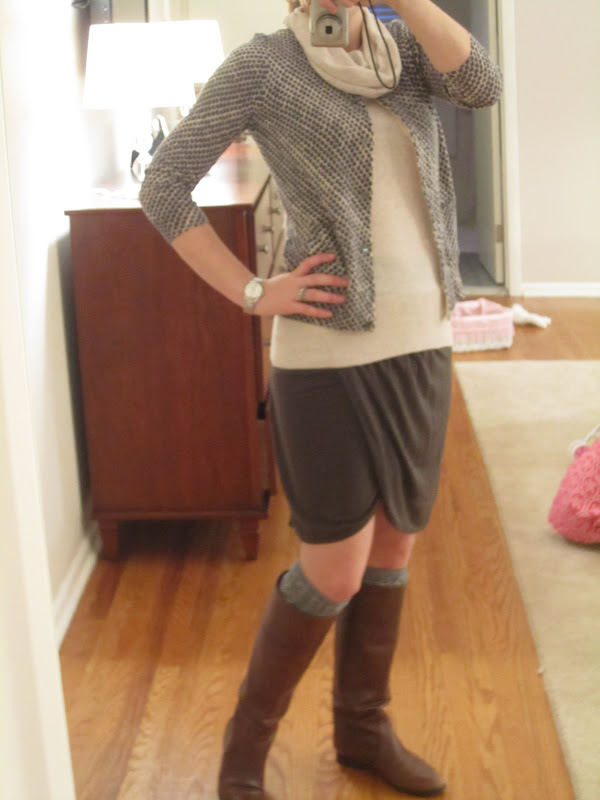 I present three of my flat-boot outfits inspired by Jamie's post! I loved the navy dress + white cardigan + mustard tights + riding boot combo in the very first picture that Jamie posted. I realized I had every single piece on hand. So I put them all together. My navy dress is actually a j.crew strapless cotton sundress. I knew it would be covered by the cardigan so I didn't sweat it. The cardigan is from Target. The belt is an oldie that I found on clearance at Kohl's. 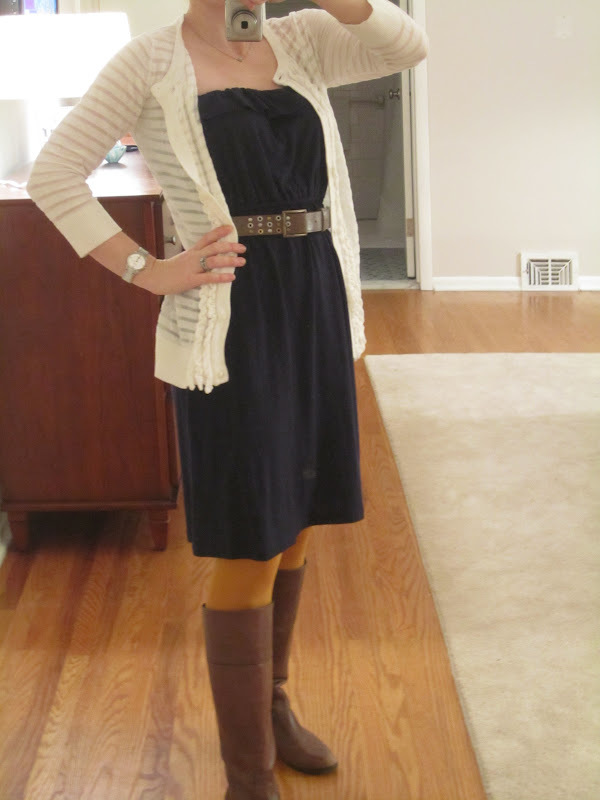 The mustard tights are from Macys on clearance. I did my hair in a messy bun and kept the accessories super simple. Voila! 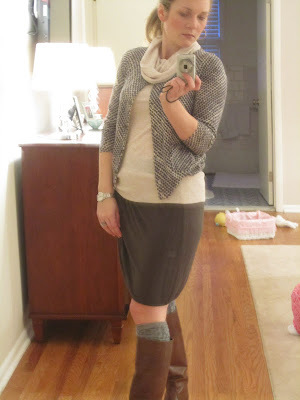 I immediately swooned when I saw the picture in the middle of Jamie's post that had the boots with a skirt and cowl neck sweater and belt. It looked so effortlessly chic. I decided to put my own spin on it . 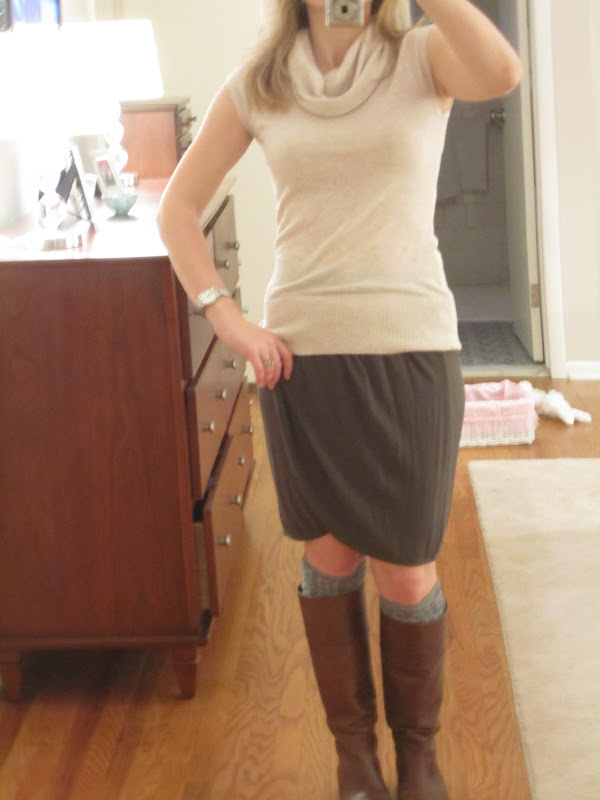 First, I tried my new (at the Banana Republic outlet on clearance for something like $5) cowl neck cap sleeve top with my green jersey wrap skirt (Target) and fun grey cable knee socks (they only look like a knit - they're actually the weight of trouser socks). 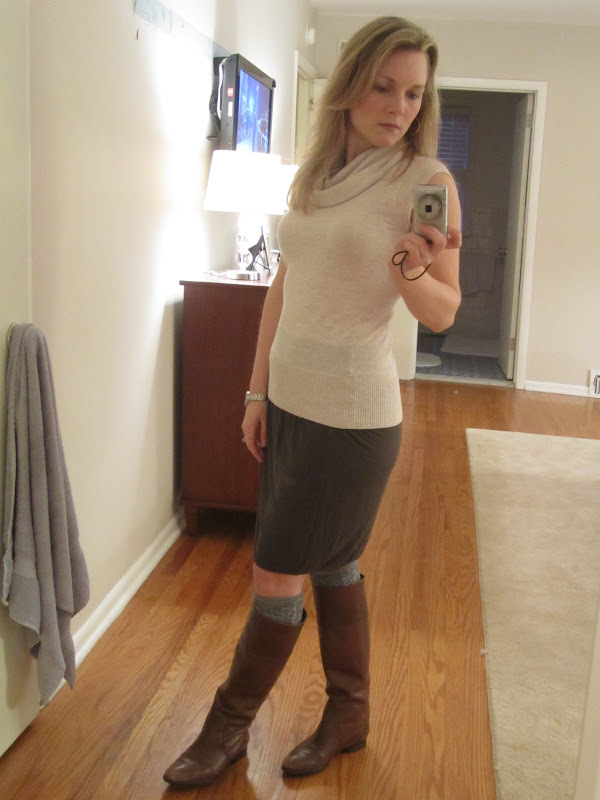 It looked really good, but I felt a little too bare for Winter. See? So to make it a little more Winter and office appropriate, I grabbed my ombre dot cardigan (j.crew) and decided my hair would look a little better in a messy pony. I threw on gold hoops and done! 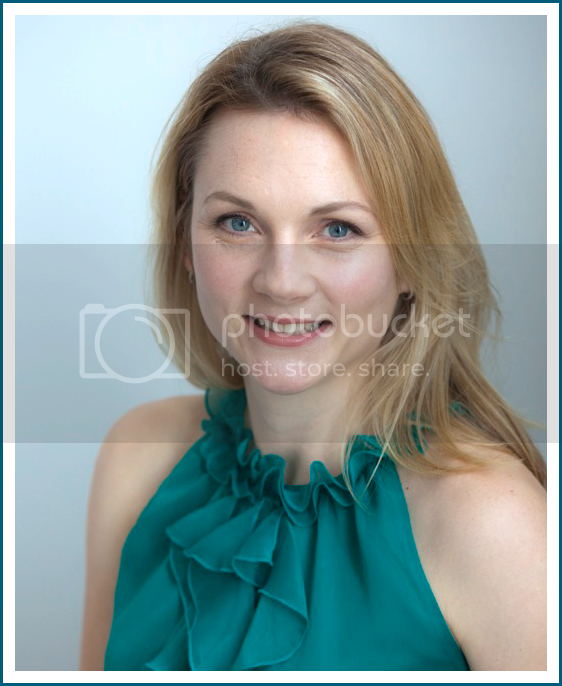 Perfect for the office - cute and chic but not too casual. I normally am not in the office on Fridays but on one particular Friday I was. My office has a jeans day each Friday so of course I was excited to wear my skinny jeans. I loved the very first casual picture that Jamie posted so I decided to emulate that one. 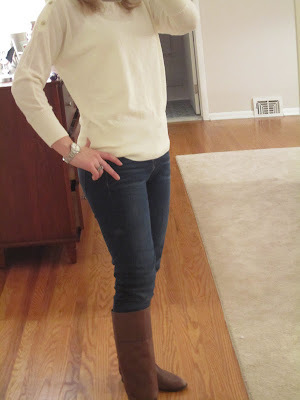 First, I tucked my skinnies into the riding boots. Then I scored an adorable kind of flowy top at Gap for less than $20. I paired it with a long white tank and here is the outfit! I paired this with my big gold hoops (to pick up the gold on the buttons on the top). And there you have it - three cute outfits courtesy of my dear sister in law. Thanks Jamie! If the weather ever cools down, I have a few more that I'd love to try out, but they require layers and wool sweaters and it has been so hot lately that wearing them isn't exactly appealing. Adorable as always! I love the yellow tights! My first fav is the cowl neck and knee socks...sooooo cute, and then you are rocking those skinny jeans girl!! Love it! You look great in them all!